I enjoy watching Gardening Australia each week and have finally managed to try out an idea I saw a while ago.You can see it here if you’re interested. For years I’ve been struggling to get a particular garden bed looking good. It slopes and our “soil” is not at all encouraging being mostly clay and shale, this bed also has gravel from when the pavers were laid. I’ve now followed Tino’s technique and hope the plants will thrive. This year we were away seeking warmth for all of August but since it’s now officially Spring I thought I’d post photos of the flowers in the garden at the moment but the weather isn’t nice at all. It’s cold and wet so lots of the flowers are looking sad and some, like the Gazanias, are refusing to face the world at all today. They were stunning 2 days ago so I’ll come back to them. It seems to me the plants are enjoying this weather about as much as I am! My dad had a lovely Crepe Myrtle Tree so when I saw dwarf ones were available I bought one and planted it in a big concrete pot. It died. I dug it out and discovered tree roots had invaded the pot and starved the poor tree of water and nutrients. I decided to have another go with a big metal tub which I placed on weed mat. The new Crepe Myrtle died. Today I dug that out and emptied the tub only to find the central hole completely clogged with roots which have grown up through the weed mat. From now on I’m going to make sure that all my pots sit either off the ground or on some solid base! The small central hole in the big tub. Strong roots growing through the Weed Mat. Recently I noticed thousands of slaters in one of my compost bins so I did a bit of research. One view was that if you had slaters and ants your pile was too dry and if there were flies it was too wet. Another said if you have slaters and cockroaches your pile is fine, they’re doing the decomposting for you, I prefer to believe that site but I do sometimes add some water. Yesterday I added scraps to another bin then checked the “ripest” one and just loved all the activity going on in there so here are some photos from that community. My favourite is the ant, not just because it’s beautiful but because I’ve never seen any like it before. Clicking on an image will take you to a slideshow where the images will be easier to see. Redback Spider with interesting “sauce” on its lunch. Readback Spider with its Earwig lunch. The Mitcham council area is divided roughly into the hills and plains. Both areas have many street trees but the hills area is characterized by dense sections of trees and shrubs. Feral Olives are a pest in some parts, covering the hillsides. Their thick leaf coverings disguise the damage they cause in gullies. Feral Olives create a serious fire risk. The trees burn ferociously and destroy the shelter provided by native plants to birds and other animals. 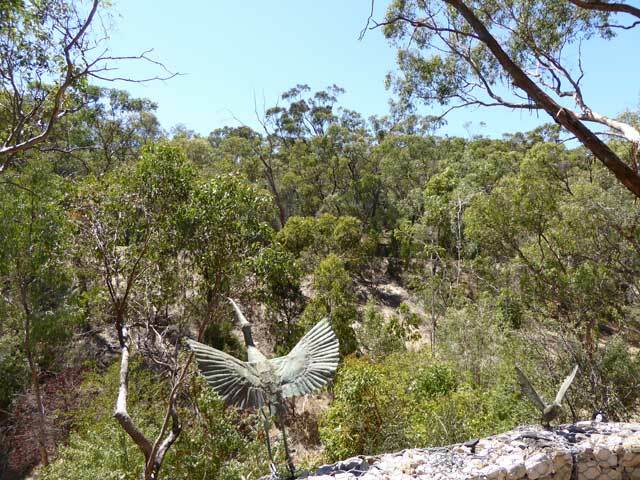 Lorikeets, Wattlebirds, Magpies and Currawongs are all found in the Mitcham hills. Grey Box Trees, although not considered as attractive as some other species of Eucalypts, sustain many Koalas and residents must seek council approval before removing any of these Trees.